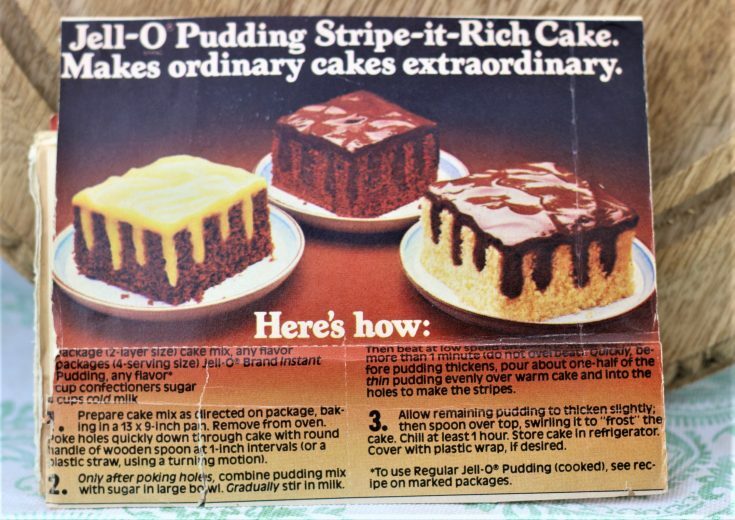 Front of the recipe card for Jell-O Pudding Stripe it Rich Cake. 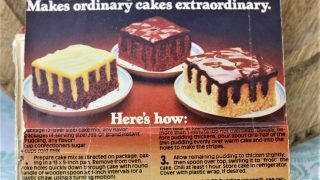 There are lots of fun recipes to read in the box this recipe for Jell-O Pudding Stripe it Rich Cake was with. Use the links below to view other recipes similar to this Jell-O Pudding Stripe it Rich Cake recipe. If you make this Jell-O Pudding Stripe it Rich Cake recipe, please share your photos and comments below! Prepare cake mix as directed on package, baking in a 13 x 9-inch pan. Remove from oven. Poke hole quickly down through cake with round handle of wooden spoon at 1-inch intervals (or a plastic straw, using a turning motion). Only after poking holes, combine pudding mix with sugar in large bowl. Then beat at low speed on electric mixer [for not] more than 1 minute (do not overbeat). Quickly, before pudding thickens, pour about one-half of the thin pudding evenly over warm cake and into the holes to make the stripes. Allow remaining pudding to thicken slightly; then spoon over top, swirling it to "frost" the cake. Cover with plastic wrap, if desired. *To use Regular Jell-O Pudding (cooked), see recipe on marked packages.